If you were sitting next to me right now, I would ask you the following questions. 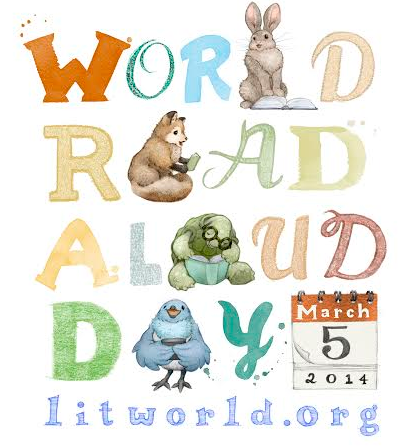 Are you ready to celebrate World Read Aloud Day? What will you read? What are you most excited about? What is your favorite read aloud? What is your earliest memory of someone reading aloud to you? Is there a book you used to read over and over when you were a child? Why is it important to show children that we support their future? What would you ask me? Newbery Medalist Christopher Paul Curtis reads The Very Hungry Caterpillar. Patrica Storms reads Never Let You Go. Barbara Reid reads Perfect Snow. Robert Paul Weston reads from Prince Puggly of Spud and The Kingdom of Spiff. Nancy Pearl reads Isabella: Star of the Story. Stephanie McLellan reads Hoogie in the Middle. Photos and Vines from Kate DiCamillo Day!